For the first time, researchers have demonstrated that a stable frequency reference can be reliably transmitted more than 300 kilometers over a standard fiber optic telecommunications network and used to synchronize two radio telescopes. Stable frequency references, which are used to calibrate clocks and instruments that make ultraprecise measurements, are usually only accessible at facilities that generate them using expensive atomic clocks. The new technology could allow scientists anywhere to access the frequency standard simply by tapping into the telecommunications network. 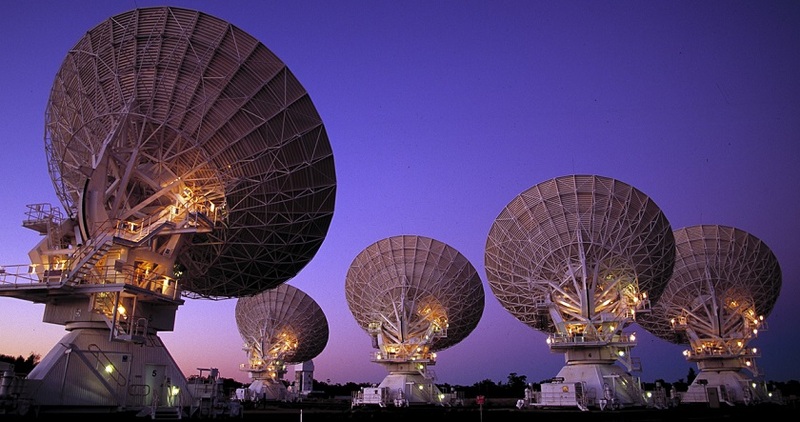 The ability to send stable frequency references over the telecommunications network could be particularly useful for radio telescope arrays such as the Square Kilometer Array (SKA), an international effort to build the world’s largest radio telescope using arrays in Australia and South Africa. When complete, SKA will detect faint radio waves from deep space with a sensitivity about 50 times greater than that of the Hubble telescope. Individual radio telescopes will be linked to create a total collecting area of about 1 million square meters. Linking radio telescopes in an array requires that each telescope have access to an atomic clock to record the precise time at which a signal is detected from an object in space. Focusing all the telescopes on the same object and then calculating the slight differences in the time for the signal to reach each telescope allows researchers to combine all the observations and pinpoint the object’s location and other characteristics. Stable transmitted references could be used to calibrate the relative time at each telescope, eliminating the need for multiple atomic clocks in a radio telescope array. In Optica, The Optical Society's journal for high impact research, researchers from a consortium of Australian institutions report on the successful transmission of a stable frequency reference between two radio telescopes via a fiber link and demonstrate that the technique’s performance is superior to the use of an atomic clock at each telescope. The consortium included Australia’s Academic and Research Network (AARNet), the Australian National University, the Commonwealth Scientific and Industrial Research Organisation (CSIRO), the National Measurement Institute, Macquarie University and the University of Adelaide. The results show that the technique is capable of compensating for signal fluctuations in the fiber optic network introduced by environmental factors such as temperature changes or vibrations. The demonstration was even performed over a network that was transmitting live telecommunications traffic at the same time. Importantly, the new technique doesn’t require any substantial changes to the rest of the fiber optic network and is easy to implement. To keep the frequency stable during transmission, the researchers send the signal through the network to a destination and then reflect it back. The returning signal is used to determine if any changes occurred. After each round trip, any transmitted frequency shift is passively subtracted to exactly compensate for the measured changes. For every 100 kilometers of fiber, the round trip takes about 1 millisecond. Even though the compensation process happens very quickly, the time on the receiving end can drift during the round trips. To solve this problem, a quartz oscillator at the remote location keeps the time steady between round trips. To demonstrate their method, the researchers began with a type of atomic clock known as a hydrogen maser located at the CSIRO Australia Telescope Compact Array (ATCA). They imprinted the radio frequency reference signal from the maser onto a laser beam that then traveled through a 155-kilometer AARNet fiber and several amplification stages to a second radio telescope, and back again. Once the compensation process began, the reference was picked up by the radio telescope at the other end of the connection. The researchers used the stable frequency reference to calibrate both telescopes, which were used to examine the same object in space. They found that rather than the stable frequency signal limiting the performance of the telescopes, atmospheric differences between the two locations was the limiting factor. To eliminate atmospheric interference and better understand how the new method improved the telescope performance, the researchers then used just one telescope antenna at the ATCA fitted with two separate receivers to take measurements. This “split antenna” method allowed one receiver stabilized by the hydrogen maser to be compared with the other receiver stabilized using the stable frequency reference that was sent on a 310- kilometer round trip through the fiber. The researchers say that their demonstration shows that the new method is ready for implementation by radio astronomers who want to avoid using multiple atomic clocks across a telescope array. The method can be used over even longer distances by using more amplifiers to boost the signal. This would also allow stable frequency references to be broadcast across a national fiber optic network, where any scientist with access to a telecommunications network could use them. Read-it @ #G+ my-home! ^TA~! !~谢谢！！.